Eric Schlehlein is an author and freelance writer, passionate about most things Americana. Signed to a contract with Deeds Publishing, LLC, his first novel, Black Iron Mercy, is now available for purchase. His second novel, The Dim White Light, is just weeks from completion. Eric has dedicated more than half of his life to serving others, first as a caregiver and group home manager for the developmentally disabled, the emotionally disturbed, and the mentally ill, and has now served his community as a lieutenant on the local fire department for more than fifteen years. He’s also been known to deliver a hot, fresh pizza at a quick pace and fair profit. As a two-time campaign manager, Eric is well-versed in political speak and has experience in writing political propaganda and speeches. 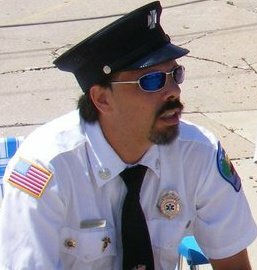 Besides his service to the Lake Country Frizz Association as President and Chief Executive Officer, Eric is also the President of the Hartland Firefighters Association, Inc., a non-profit organization that is dedicated to serving the membership of the fire department and the community it serves through various charitable endeavors. In 2013 Eric wrote the script for “Align on the Colors, Close up on the Colors,” a nine part documentary on the charge of the 6th Wisconsin Infantry Regiment on the railroad cut at Gettysburg, filmed and narrated by Gettysburg expert Frank P. Marrone Jr. Thanks for liking the blog Eric. I guess I’m too far away for one of the pizzas. doh! Very cool blog! Can tell you put time and effort into it! Thank you Eric, for liking my blog ‘Spirit of the Jaguar’. I wish you every success with your own literary project. I think you have had, and still have, a very rich full life! Thanks for the ‘like’ on my ‘Way out on a limb’ post. I’m glad you enjoyed it. Hope you get yourself an agent! Congratulation for your new coming soon book! Wish you all the best! I follow now. Hey Eric, thanks for stopping by. My son works with DD folks–bless you both. Also like your idea of listing other blogs you like. I saw one I’ll try out. All the best with Black Iron Mercy and thanks for viewing my note. It means alot. Thanks for the like at http://www.superteachersuperhero.com. Wondering how you found me? Love all the things you’ve done. Keep us posted on how it goes with finding an agent! Thanks for liking my photo101 post about “Treasure.” Have a great day! Thank you for stopping by my blog Eric and good luck with publishing your book. Congratulations too for your script about Gettysburg – I was privileged to visit there in 1984 and learnt so much more than I ever got from the history books – as a history buff I’m so glad you are writing and helping other generations learn about that amazing time in American history. Thank you for stopping by my blog 🙂 Thoughts and Sensibilities. Hi Eric, Thanks for liking my Post “Angellis Traballium.” Hopefully you had no trouble linking over to YouTube to listen to it. (Every Song I play is Original, and Composed by ear, for I can’t sight-Read, nor Write Music). As Cultural Creatives, it’s Important we Support each other, in our Attempts, at stepping out of our Comfort Zones. Myself, I’d resisted releasing any videos until now, (and when I did it was totally casually dressed, in a messy apt, with bad hair, but what matters is the message contained in the Song, not my Appearance (or my Piano’s, for that matter). As for Your Manuscript Queries, a Special thanks for your Candid Writing about it. I’m a Self-published…, barely, writer, (well…, I did write for my university newspaper 3 1/2 yrs, so it’s not like I’m totally green). Once I’ve moved, getting re-published will be one of my plans, and your Blog entries have just made it that much easier to turn potential deflating experiences, into Victories. THANK YOU! Namastè! Thanks for dropping by aunt-Bea-me. I’ve enjoyed exploring your blog. Keep your eyes on each detail of the journey; in the end you will realize they have been far more interesting than the final destination. Eric, thanks for stopping by Puddletown Reviews and “liking” my recent review. Hope you’ll come back. Enjoyed visiting your blog. It appears from this About page you are one busy man! What an interesting life you’ve led! Congrats on completing your manuscript and good luck with the agent hunt. Thanks for checking out my blog. You have a new follower in me. Thank you for liking my blog, Eric. Extremely interesting content. You have gained a follower. Hi, Sorry Eric, I don’t see a “Contact” link, so I keep writing you on your blog. Here is what I posted today on the post where we met: Just trying to find out when it might be done. No pressure, I just want to be able to schedule it on my calendar. I am looking forward to receiving your guest post about how you were able to get such a large following in such a short time. I know my readers will be fascinated. Do you have any idea when it might be ready for me, so I can schedule it on my editorial calendar? Once again, send it to janicegreenfield123@gmail.com as a MS Doc attachment with a short bio and a link back to your site. I will publish it. Thanks so much! Your document has been sent via email. I tell you this here in case it ends up in your spam folder. If it is not what you wanted, I’ll understand. My methods are a bit different from the norm. I got it Eric. I am reading it right now. Thank you. I have a question: is it networking one hour a day when you don’t blog or do you network one hour a day every day whether or not you blog? I usually don’t network on days I blog. Lately, however, I blog less and less. I get more hits on days I don’t blog than on days I do. That’s not to say I avoid blogging in order to gain hits, though. You have to remember that I really didn’t want to blog in the first place. As a freelance writer, I spend enough time in front of a keyboard. Thanks for “liking” my blog. Great work you’re doing for the civil war regiments. Congrats on your manuscript! Funny. I smiled at this. Thanks for liking my post. thanks for stopping by my blog! you have an impressive about page..has made me rethink the whole of mine 🙂 keep doing what you’re doing! Thanks for liking my fiction, “Ahead on a Stick.” You’ve got good momentum going in your writing career. Congratulations on your accomplishments! Thanks for your like on “MacDougal Chronicles” Blog. Best of luck with the book! From my experience, I’d suggest self-publishing while you’re trying to find an agent and a publisher. Building up a fan base is a good idea when you’re trying to sell yourself! How kind of you to ‘like’ my very silly post. You sound like an accomplished, well-rounded individual. I look forward to reading more. Thanks for the like, I appreciate it! Hi Eric, Thanks for liking my re-blogged post from my editor Eamon O’Cleareigh. I look forward to exploring your blog. Eric, thank you for the like on my blog. I enjoyed reading your article about Captain Rufus Dawes. I have always been fascinated by Civil War history. I have visited Ft Sumter along with many other Civil War battle sights. I’m currently reading a book (fiction, part one of a trilogy-only the first 2 or out however) and will be reviewing it soon. It was awesome to read about you and your son inventing a new game!! Congrats. Thanks again and God’s Blessings to you and yours! Thanks for liking my blog post. It is the first on my new blog, just set up hours before you read it! I haven’t even had time to find a more appropriate banner image than the one that comes with the theme. I’m working on my memoir and will be sharing information about my life – pieces that don’t fit within the arc of my journey from adventure-seeking young woman to a middle-aged woman with a mission. I hope you’ll check back again soon. Sure thing, Sandra! Congrats on the new blog and best of luck on the memoir! Thank you, Greg! I’m so glad you enjoyed it and I appreciate you reaching out to me to tell me so! Thanks for stopping by my place (http//:literarynomad11.com). I promised to share parts of my forthcoming novel with anyone who stops by/likes/follows my blog. I looked for your e-mail address so that I can share Chapter 1 of my forthcoming crime fiction novel as I promised. Please send your contact information to me at fohanenye@gmail.com or starseller11@ymail.com. Thanks for your dedication to service. Congratulations on your books. Black Iron Mercy is a book of terrible beauty. Look forward to your next work! I (like many) have read a lot on the Civil War. Fortunate to walk the battlefields, trying to imagine the courage, dedication and duty. Your novel adds much understanding. Thank you for relating the struggles that continue after colors are cased. Your words frame the continued battle of mind and body; impacting service members across old and new conflicts. Your words are beautiful. They humble me in their origin, coming from the mind of a man who knows all too well the experience of service and sacrifice. Thank you for these words. And thank you for all you’ve done for me and the other citizens of this great nation. I’m forever grateful.